What goes into a good appraisal? First, you've got to know about the instrument. I research using all kinds of resources, including my own library of antique catalogues, plus I've seen hundreds and hundreds of instruments. 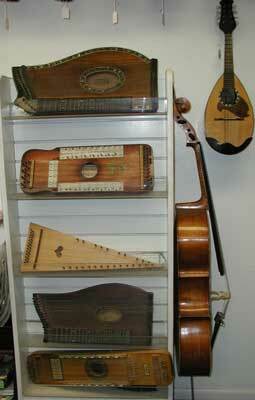 We appraise instruments on their construction, age and tonality; those are the basics. The country of origin can indicate great value — or mediocre value. Does the instrument have a history? If Grandma played it on the radio in the 1920s, it may influence the value. Along with all that, you factor in aesthetics, the overall appearance, and the craft: How well is it made? Yes, you can do your own estimate by searching Internet auction sites — but a professional appraisal has this advantage: We're not trying to sell or acquire the instrument, so our valuations aren't influenced by personal profit. Appraisals cost as little as $45 for a verbal assessment of photos you send me, or we can do a full appraisal and estimate of restoration costs. Call or email for an estimate.